There seems to be a flood of content-management applications for the Mac, one of which is ShoveBox. Up until recently, this content—text, images, URLs—has had to stay localized on one computer. But ShoveBox maker Wonder Warp has come out with an iPhone app that lets you collect, organize, and edit data when you’re out and about, syncing that data with your Mac. A Place for Everything: ShoveBox Mobile not only lets you collect information when you’re on the go, you can also organize it with folders and labels. The core function of the $4 ShoveBox Mobile is to store information, which means you can input text, photos, Web archives, PDF files, and many other file formats into the app. There’s even a bookmarklet for adding bookmarks to Shovebox Mobile from Mobile Safari. You can then organize these files using using folders and labels; you can also add comments and annotations. Using Wi-Fi, ShoveBox Mobile syncs up all files and changes with the desktop application. ShoveBox Mobile’s interface is simple and elegant but powerful. It is able to get the job done easily without any distractions or clutter. Little things like being able to convert rich text to plain text for on-the-go editing make using Shovebox Mobile a pleasant experience. It’s also easy to use and simple to get started with. There are very few flaws with Shovebox Mobile, though. The only notable annoyances appear when dealing with photos. The app doesn’t offer an option to insert an already-taken image into a note. Unlike text files and bookmarks, photos added to Shovebox Mobile will only go into the inbox upon creation—not to a specified folder. Of course, these files can then be moved after creation. 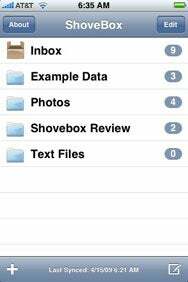 Shovebox Mobile is the missing companion to Wonder Warp’s desktop application. If you are in the market for a content organization system, Shovebox is undoubtedly a strong and viable product. ShoveBox Mobile is compatible with any iPhone or iPod touch running the iPhone 2.2 software update.